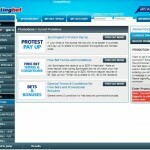 Sportingbet Australia is a well-respected and trusted online bookmaker. They make the life of an Aussie punter that much easier by having a website that is simple to use. However, apart from finding betting options (which are excellent) many punters might have a hard time finding other information such as banking, terms and conditions and other general information. With this said, it’s clear that this is one of the best operators when it comes to the level of customer service, banking options and variety in the sports market. 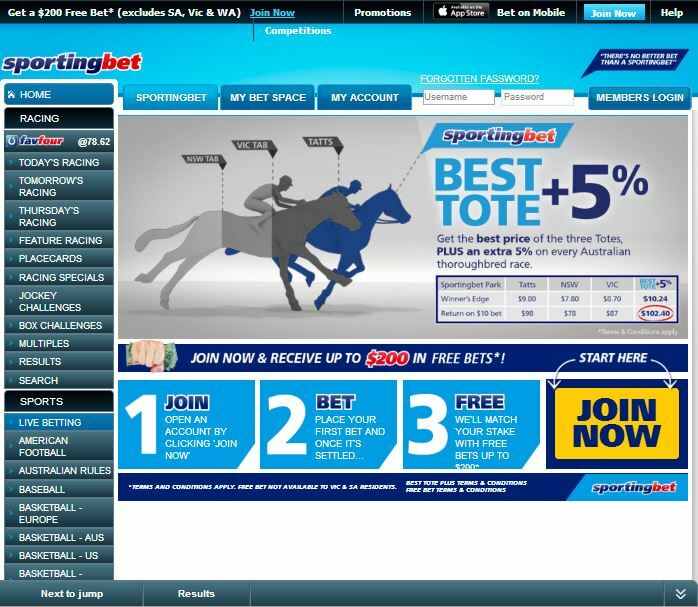 Sportingbet (Sportingbet.com) was founded in 1997 and is operated and managed by its parent company Sportingbet PLC and licensed under Lotteries and Gaming Authority, Malta. Sportingbet Australia (Sportingbet.com.au) was launched in 2003 and is a licensed bookmaker under the jurisdiction of the Northern Territory with offices in Darwin and Sydney. The Sportingbet Group in 2011 acquired another Aussie bookmaker Centrebet. In March 2013, the UK betting giant, William Hill acquired Sportingbet Group’s Australian business, consisting of Centrebet and Sportingbet. 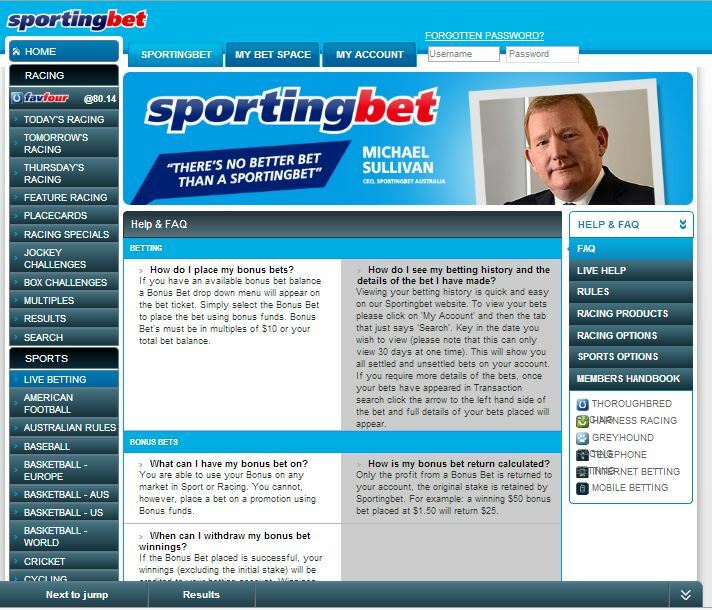 Sportingbet has grown by acquiring several smaller online gambling companies, most notably SportingOdds.com in 2002 and Paradise Poker in 2005. 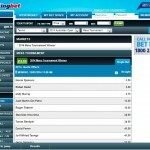 SportingBet now has tremendous presence in the UK, across Europe and Australia. Thanks to its TV advertising and sponsorships in events like the Melbourne Racing Club and South Australian Jockey Club, they are now one of the strongest Australian bookies present today. Sportingbet’s website might not be the flashiest around, but after exploring and testing out some of the features; it is very easy to navigate, especially when it comes to finding betting options. We must say that Sportingbet has one of the most dynamic website interfaced where most of the times user do not even have to move away from the home page. However, it is also necessary to mention that their ‘About Us’ page or the ‘Help’ page is confusing and many users also might find difficult to location necessary information therefore not giving users a pleasant experience. There are quick links that let customers get straight to ‘today’s football’ and ‘next 5 races’ and this is particularly impressive as they realise that we all want to place a very quick bet sometimes. 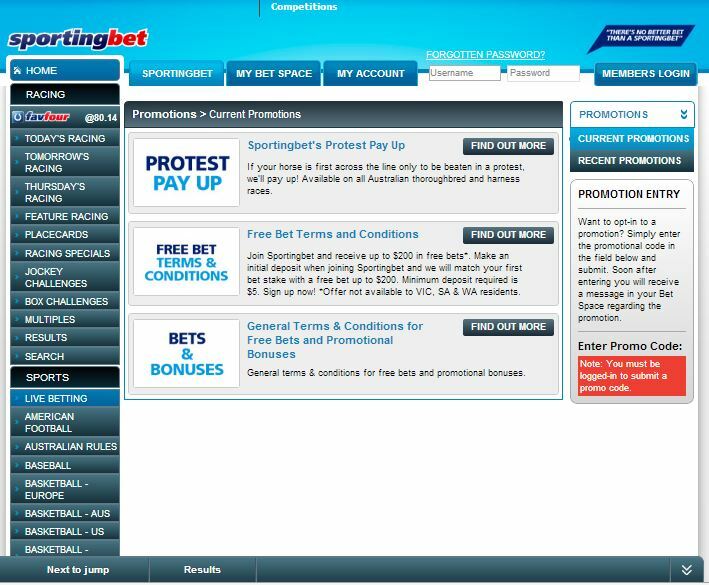 When clicking on a selection, this will automatically populate the online bet slip, while the In-Play console takes pride of place in the middle of the homepage. The betting odds are displayed in the large centre column. One quirk of the odds area is you have to switch between ‘Multi Bet’ and ‘Single Bet’ tabs at the top right. This determines whether your next selection is added to your betting slip as a single bet or as a multi bet. This unique feature is unintuitive for novices, but it does enable you to add single and multi bets to the same betting slip. One downside of the odds display area is that it doesn’t present head to head odds for a round of matches in a concise manner. A lot of scrolling up and down the page is needed to find your market of choice. Sporting Bet are much stronger when it comes to market coverage, something which reflects that they have a global proposition and a very even spread of customers all over the world. 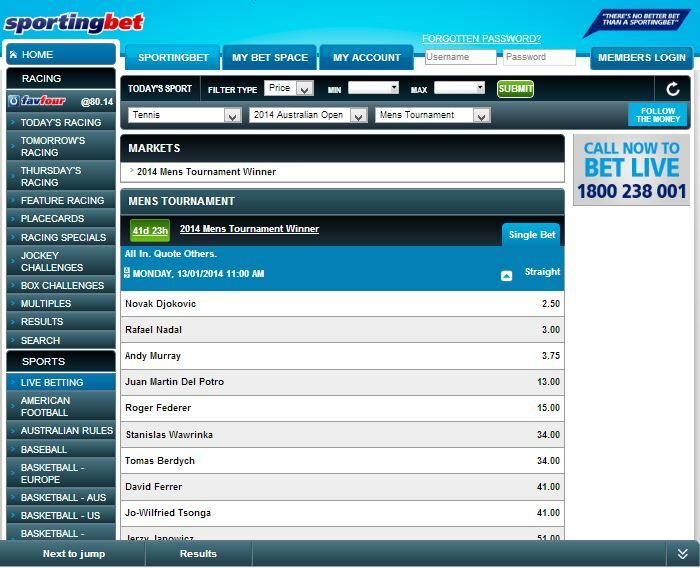 Sportingbet offers both a great range of sports markets and a good (not great) depth of betting options. 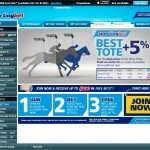 Sportingbet offers daily Australian thoroughbred & harness racing, and greyhound racing as well. As an OZ focused bookie, they also offer hundreds of bets for NRL and AFL for every round. Of course they also offer A-league, cricket, F1, MMA, golf, tennis, and every other major sport you’d expect. Beyond the typical Aussie sports, Sportingbet also covers the most popular sports around the world. This includes all of the best football (soccer) leagues, IPL, boxing, NFL & NCAA football, NBA & NCAA basketball, MLB, NHL hockey, volleyball, and nearly everything else you can think of. The In-Play section can often be a little slow to load, although there’s no denying that it’s one of the best live betting offerings in the industry. There are typically a dozen live markets being offered in real time, although the look and feel could possibly be improved upon to make the odds changes a little more dynamic. Due to Australia’s Interactive Gambling Act, live online betting at Sporting bet is not available for Australians. Australian customers must phone in to bet live. Thankfully, Sporting bet has a full-fledged phone betting service open 24/7 to Australians. What really makes SportingBet shine is their excellent, industry-leading mobile betting platform sbet.mobi. Their mobile system works on any phone with internet access. Their mobile site is one of the most thorough in the industry, allowing punters to place bets on any event they could on the regular website and make multi, or exotic, bets as well. All these features are also available through their apps on all platforms such as iPhone, iPad and Android. The minimum online bet is $1.00 for sports and $2.00 for racing, through the phone is $20 for sports and $ 50 for racing. Naturally, Sporting Bet’s prices are competitive, although they don’t have a reputation for fantastic odds. The odds format presented at Sportingbet are the standard EU odds or decimals. One of the positives about the list above is that they accept PayPal. If you’ve ever bought anything from Ebay, you already have a Paypal account. If you don’t have one, a Paypal account is easy to set up and then it’s easy to move your money back and forth between different online bookies and your bank. The above mentioned banking options are available to Australians through Sportingbet.com.au but their primary website Sportingbet.com offers more banking options such as Debit Cards, Ukash, Neteller, Click2Pay etc. All deposits are instant except for Bank Transfer and Bpay which may take between 24 and 48 hours. With such a large presence in the gambling market, it is no surprise that SportingBet has excellent promotions for new players as well as plenty of interesting things going on to keep existing players coming back. There are terms and conditions to be attached to each of the promotions. Players are advised to understand each T&C before being tempted by their great bonuses. For instance, for any free bet or bonus credit to be cashed out, a turnover of 1x is required and the minimum bet should be $5.00. Similarly, there are other conditions attached. If players are able to digest all their clauses, we then suggest taking great advantage of their bonuses. Sporting Bet are particularly fast at getting back to customers through email and telephone. The knowledge of staff indicates that they have been well trained on a variety of bet types and payment queries, while they are also courteous and polite.